Are you searching for some of the most romantic castle hotels in Ireland for getaways and vacations? This article contains castle hotels with a wide range of amenities such as spa, golf course, pool, fairytale castle wedding venues, wonderful gardens and many activities (horse riding, fishing, falconry and shooting, cycling and kayaking). You will find here spectacular 5 and 4 star castle hotels, luxury hotels at affordable price and castle hotels near and in Dublin. Dromoland Castle was originally the ancestral home of one of the few families of Gaelic Royalty; direct descendants of Brian Boru, the High King of Ireland. Approached by a meandering drive that passes acres of magnificent lawns, this luxury 5 Star Castle Hotel overlooks its own Championship Golf Course and a glistening lake which commands the panoramic beauty of the surrounds. In one of the best castle hotels in Ireland, guests can relax under the careful attention of the staff and enjoy an exquisite selection of gourmet fine dining and delicious wines; unwind slowly in the Castle’s 5 Star luxury Health Spa or indoor heated pool; or enjoy a good book beside a crackling evening fire. 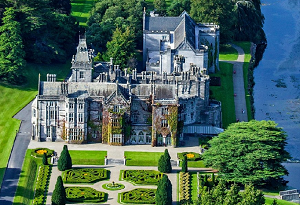 Situated just 8 miles from Shannon International Airport, and regarded as one of the top luxury hotels Irelandhas to offer, Dromoland Castle Hotel Ireland is the ideal base from which to explore the vibrant cities of Limerick and Galway; the magical Shannon region and Ireland’s rugged West Coast. One of the most romantic castle hotels in Ireland for unforgettable romantic getaways and vacations or for a spectacular wedding. This Castle Hotel is situated in the heart of Adare Village in County Limerick and is one of the most romantic castle hotels in Ireland. Meander through stonewalled gardens and winding woodland paths, discover the colorful history of Adare Manor and its story-filled walls. Some of the services and activities are: elegant and luxury spa, winding woodlands, French gardens, orchard and walled gardens, a host of curiosities including an Ice House, a number of Ogham Stones and lost cottages hidden deep within the estate, Historical Tour of the Manor House and an Irish Whisky or Wine tasting. The magnificent five star Ashford Castle is set in 350 acres, on the picturesque shores of Lough Corrib and is one of the best castle hotels in Ireland. Dating back to 1228, the castle now enters a new chapter in its history, as part of The Red Carnation Hotel Collection. With 82 guest rooms, a wealth of activities and thoughtful touches, enjoy acclaimed Irish hospitality on a grand scale. Unique guest rooms with spectacular views. Luxurious staterooms and suites. Widely regarded as the most luxurious destination hotel in Ireland, discover beautifully appointed rooms and suites and elegant dining rooms, serving fine Irish cuisine along with a renowned Afternoon Tea service, led by Head Chef Philippe Farineau. The expansive 350 acre Ashford Estate lends itself perfectly to a range of activities, from country classic pastimes such as horse riding, fishing, falconry and shooting, to more modern activities such as golf, spa, cycling and kayaking and Ireland’s first school of falconry. 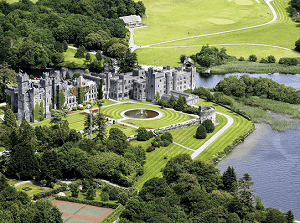 So whether you are the active type or prefer to relax and soak up the scenery, you are spoilt for choice at Ashford Castle – one of the best castle hotels in Ireland for romantic getaways and vacations. From the moment you arrive through the 100 acres of beautifully manicured gardens and parkland to this magnificent 19th century 4 Star Castle Hotel & Wedding Venue in Ireland, set deep in the Cavan countryside, you will feel totally welcomed and thoroughly spoiled. From the splendour of the Lords Bedchamber to the spaciousness and charm of the Courtyard rooms or delightful cottages a sumptuous stay awaits you at Cabra Castle Hotel, one of the best known and most luxurious castle hotels in Ireland for romantic getaways and vacations. Perfect for gala events and fairytale castle weddings. Set on 100 acres of parkland and garden, with the magnificent backdrop of Dun a Ri Forest Park, there is much to explore both indoors and out. You will find here also 9 hole golf course and a game of tennis on the hotel’s hard court amd many activities available nearby. Situated on its own private Island on the River Suir, Waterford Castle Hotel & Golf Resort offers Luxury Castle Accommodation nestled in the suburbs of Waterford City. 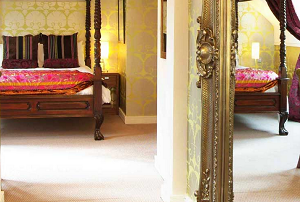 The traditions of Waterford Castle are honoured in the décor of the 19 elegant bedrooms; each one offering gracious style, unique décor and antique furniture. The original cast iron windows set in granite stone overlooking the splendour of the Island will take you to another world. Waterford Castle Hotel and Golf Resort boasts luxurious three bedroom holiday homes within its 310 acre island resort, superbly designed; the comfortable and stylish lodges provide the perfect escape for all the family. Designed by Des Smyth, former Ryder Cup player, and opened in 1992, the hotel’s 18-hole, par 72 championship golf course, complete with luxurious clubhouse, leads you through mature woodland and parkland. One of the most spectacular castle hotels in Ireland for memorable romantic getaways and vacations. 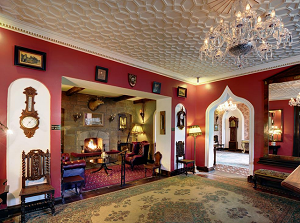 Ballyseede Castle, one of the best known Castle Hotels in Ireland, has a history dating back to the 1590’s. Set in 30 acres of native woodland Ballyseede has been wonderfully transformed into a luxury hotel for you to enjoy. 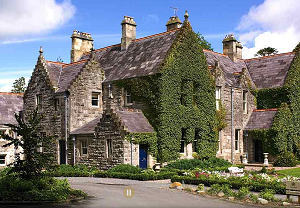 One of the most unique & special luxury Tralee Hotels, this Castle Hotel offers you formal and casual dining, 23 en-suite bedrooms and 3 beautiful private rooms complimented by enchanting formal gardens. 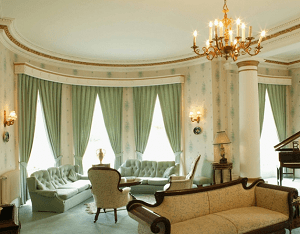 Rooms are elegant with the delicate mixture of old world decadence complimented by modern luxury. Ballyseede Castle is a very popular wedding venue in Ireland and is the only Castle Hotel in Kerry. Family Friendly Castle Hotel Ireland – Castle Hotel Family Rooms offer comfort, security and great value for money for families wishing to enjoy a Castle getaway. One of the most romantic castle hotels in Ireland for unforgettable vacations. Castle Leslie Estate in County Monaghan is nestled on 1,000 acres of undulating Irish countryside, dotted with ancient woodland and glittering lakes. One of the most romantic castle hotels in Ireland. Located in Co. Monaghan, Ireland, the Estate is near Dublin – only 80 minutes from Dublin and 60 minutes from Belfast. 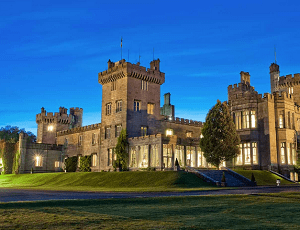 A truly private and stunningly beautiful estate, this castle hotel in Ireland is a magical setting for a romantic getaway in Ireland and for Irish Castle Weddings. The Estate offers an idyllic setting for outdoor activity and adventure that few other Monaghan hotels can offer. It’s the perfect place to discover the thrill of exploring the countryside on horseback or foot. Some of the other activities are: fishing, walking, team building, kayaking, Falconry, and more. Alternatively, you might prefer to enjoy a massage in the Spa with Victorian Treatment Rooms at the end of an activity packed day or relax with a book in one of the hotel’s many beautiful rooms while staying at one of the finest Castle hotels in Ireland. The Clontarf Castle Hotel in Dublin, Ireland is a perfect blend of a boutique and luxury hotel, providing unique style and exceptional service in comfortable surroundings. Located just 10 minutes from the heart of Dublin City Centre and 5 miles from Dublin Airport, the Clontarf Castle Hotel in Ireland is one of the most romantic castle hotels in Ireland for memorable getaways and vacations. 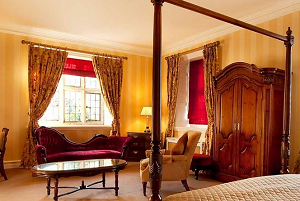 You will find here Luxury Castle Accommodation from the fashionable style and comfort in the deluxe bedrooms to the definition of opulence in the hotel’s individually designed executive rooms and suites, many with four-poster beds and views of the Dublin Mountains. Clontarf Castle Hotel is an ideal conference Dublin venue in the perfect location for a Dublin Conference Hotel. This 12th century castle hotel which has an impressive classic and stylish interior, is set in idyllic surroundings among leafy grounds with pretty gardens to the front of the stunning castle façade, is a magical setting for your special wedding day in Dublin. One of the most romantic castle hotels in Ireland for unforgettable Dublin Wedding. See also castle hotels in UK and castle hotels near London.